You manage foreign keys for InnoDB tables using the Foreign Key Relationships dialog. 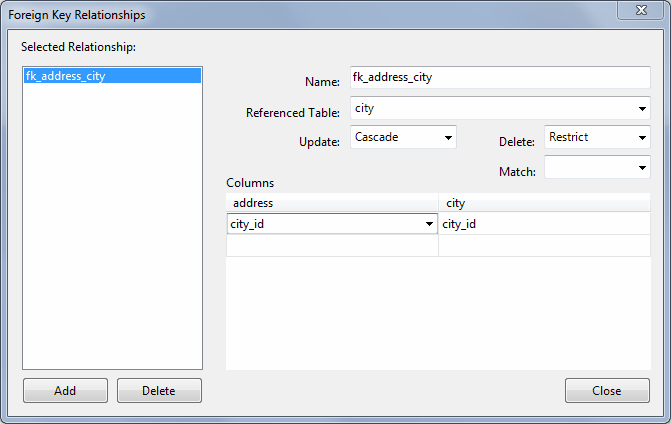 To add a foreign key, select Table Designer, Relationships... from the main menu. This displays the Foreign Key Relationship dialog. Click Add. You can then set the foreign key name, referenced table name, foreign key columns, and actions upon update and delete. To remove a foreign key, select it in the list box on the left, and click the Delete button. To change foreign key settings, select the required foreign key in the list box on the left. The detailed information about the foreign key is displayed in the right hand panel. Change the desired values.